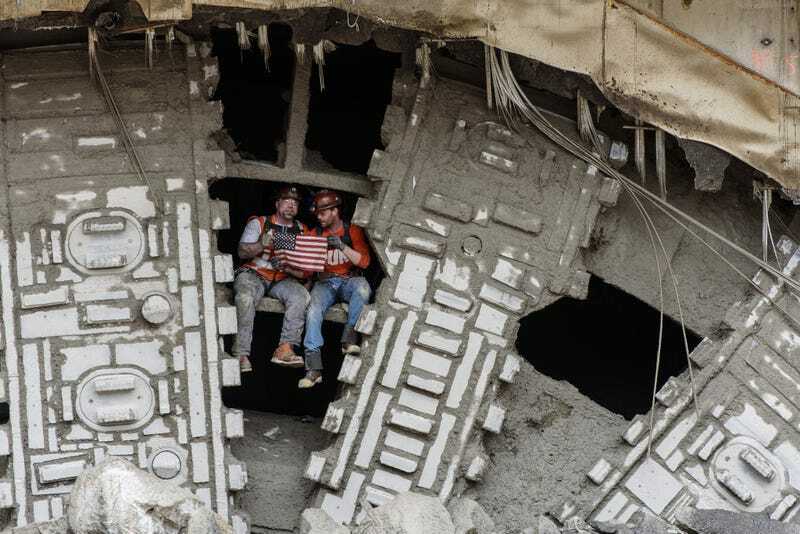 The story of the world’s largest tunneling machine, Big Bertha, is filled with hiccups and missteps along its nearly two-mile journey under the city of Seattle. On Tuesday, Bertha saw light—and there’s pictures to show for it. Though it won’t be completed for another two years, Bertha’s carried a lot of the weight of the project so far. Which is why the Washington State Department of Transportation saw it fit to mark this week’s occasion, releasing a lovely video of the machine working its way through. “This is a historic moment in our state’s transportation history,” Gov. Jay Inslee said in a statement. The WDOT said crews will be on-site over the coming days to remove support braces situated between the machine and a disassembly pit. From there, officials say, Bertha will then be cut it into pieces. Until then, take a look at these photos.